When I was a child, I couldn't get enough of fantasy stories. I adored The Chronicles of Narnia, Edward Eager's magical books, Mrs. Frisby, Tolkien, Lloyd Alexander, the Oz books, Diana Wynne Jones, Lewis Carroll - anything I could get my hands on. One writer I often heard mentioned, particularly in Edward Eager's novels, was E. Nesbit. I searched through the card catalog (actual cards, back then), asked my beloved children's librarian for the books - nada. 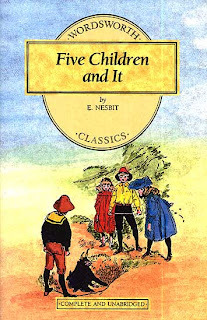 It wasn't until a few years later that I found an E. Nesbit book at our local bookstore. I bought it on the spot and devoured it with delight. It was Five Children and It, and I adored it, along with all her other books I was able to find, some fantasy, some not, but all dealing with realistic children having highly entertaining adventures of one sort or other. Five Children and It is the first in a trilogy of books about five brothers and sisters, two girls and three boys, one of them just a toddler. In this book, they have come to the country from London, and while the mother doesn't appear thrilled with the move, the children are delighted with all the exciting things they can do in the country (as opposed to the city, where there are so many rules and restrictions). The book is set in the time in which Nesbit was writing, the early 1900s, and I should mention that today's readers may find the language a bit old fashioned and some of the vocabulary a little puzzling (a trap, for example, as in a cart). I remember wondering a bit at some of it when I first read the book, but I found it strange and wonderfully exotic. I just read this to my first and third graders, and they asked me to explain something a few times, but didn't seem put off by it in the least. I suppose at that age there are always oddities to puzzle about in every book. In any case, the five children explore the area around the big white house where they are now living, and they discover a sand pit. An attempt to dig to Australia leads to the discovery of an unusual furry brown creature buried in the sand, with eyes on the ends of little stalks, like a snail's. It calls itself a Psammead; it is an ancient sand fairy with the power to grant wishes. The children can have a wish every day - just one - and the power of the wish lasts until sunset. The only problem they have is coming up with the right kind of wishes. Sometimes what they wish for turns out completely differently than they expect, and sometimes one of them blurts out a wish, an offhand desire, not a real wish, and of course that doesn't work out, either. But what doesn't work out for the five children makes for an enthralling, entertaining tale for the children who are reading about it! This brings back memories, as did all the names you mentioned at first! One of my first fantasy reads as a kid (possibly *the* first) was E. Nesbit's The Book of Dragons. How I loved it! I came across a story by E. Nesbit in an anthology of Victorian fairy tales a while ago, and I absolutely loved it. I've been meaning to read more of her work ever since. Thank you for this wonderful review! I've heard of Nesbit's books a couple of times but I still haven't gotten around to reading any! Man....is it bad that have I never even heard of E. Nesbit?? Fantasty wasn't actually my choice of genre when I was younger, though now I'm not really sure why! Sounds like I should pick this up for me and my son! 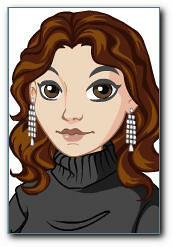 Nicola - it was fun thinking about all those writers whose books made me grow up to be a book lover! I'm glad you enjoyed them, too. Stephanie, Nymeth and Ladytink - I'll be curious to hear what you think when you read her books. One of my particular favorites is The Treasure Seekers, the first in a trilogy about the Bastable children (not fantasy). The oldest brother narrates, and he's so funny! It is a wonderful book. We have the film in our Netflix queue, so we'll see how that is. Should be fun for the kids to compare the book and the film, and any rate.